Your RVs tires are one of the most important things on your RV. They are literally the components that help make your RV move so they should be taken care of properly. However, sometimes they’ll need replaced or upgraded to something better. The following article will discuss in detail the various types of tires you can get and the pro’s and con’s that come with each. There are a few different types of tires that will provide different experiences for your RV. It’s best you find the most suited for your RV before purchasing as they’re very specific to what RV they work best on. A special trailer tire are designed specially for trailer-position axles only. These tires are designed with larger polyester cords and robust sidewalls which increases their durability and ability to handle larger weights. Light truck tires aren’t as strong but still stronger than your standard car tires. These tires are far more flexible but not as strong which means they’re more likely to puncture or cripple under heavy loads. The only real benefit to these tires are that they can be used at faster speeds compared to their counterparts. Many modern RVs come with radial tires. Radial tires have steel belts that sit at a 90-degree angle from the threads centre line. This basically translates to radial tires having a stronger overall frame which means less blow-outs. Bias-Ply tires have something similar but it’s a nylon thread that sits at a 30-45 degree angle from the centre line. These tires are cheaper and work best for short family vacations in the RV. Whereas, Radial tires are best suited for longer lasting adventures. This section is most likely one of the most important as it discusses in detail the various features, pro’s and con’s of the best tires currently on the market. We hope this section helps you in choosing the best tires for your RV. 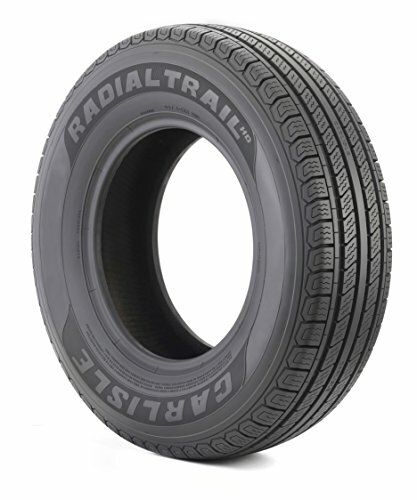 This tire is a radial trail trailer tire which means it has a strong and robust frame made for long distance journeys. This product is made specifically for trailer position axles only and will be able to support larger loads. The tread wear on this tire has been improved from previous models making the traction control fairly advanced for a radial tire. The improved heat resistance is also a huge factor as this tire will last in the hottest of summer days and won’t have any heat penetrate the tire to cause damage. This tire is one of the most durable and strongest tires that you’ll be able to find on the market. Because of the incredibly strong sidewalls you’ll be able to support larger loads. 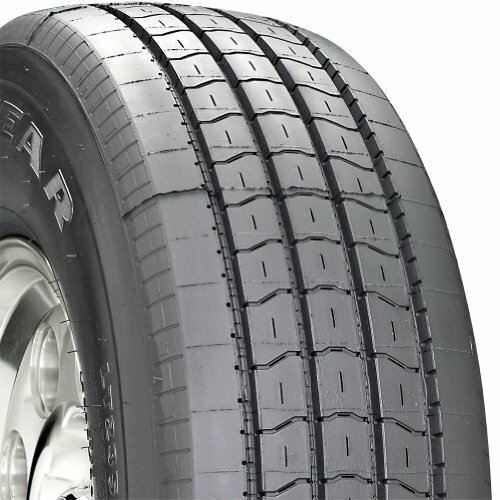 The improved tread wear will give your RV great traction and control when driving. The overall improvements made to this tire allow the lifespan of the product to increase by 10%. The special tires are heat resistant which limits the damage that the heat can cause when if it penetrates the inside tires. The only downside to radial tires is that you can’t use them at the same speeds as you can with their counterparts like the light truck tires. 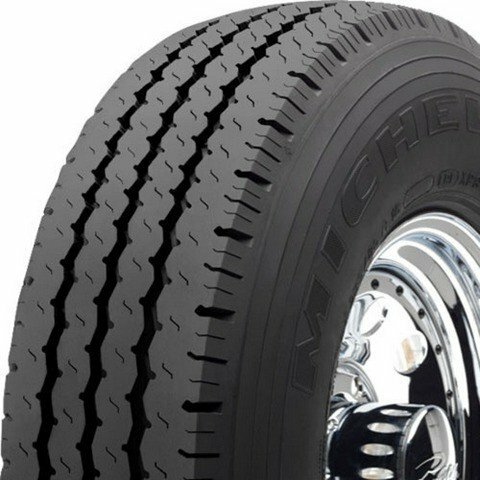 This Michelin radial tire is the best of it’s range; the tread compounds have been specifically designed for larger vehicles like RVs, these tires will last longer than any other tire of it’s range. The steel reinforcement adds strength to the tire and maintains a long lasting life. 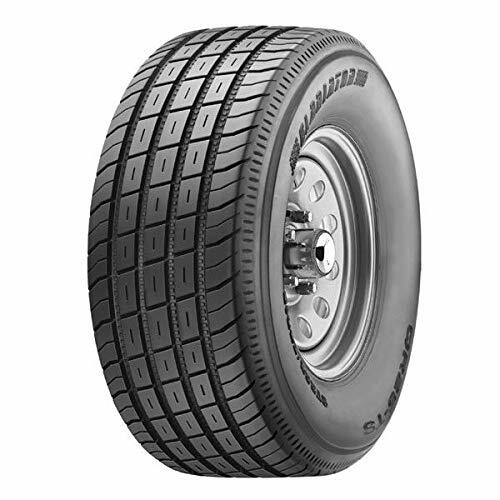 Radial tires will be able to carry larger weights which is ideal for any RV owner. Having been engineered for more industrial uses, this tire will provide great dry and wet traction. This product is specifically designed for more industrial uses which already gives your RV a great advantage on the road. The wet and dry traction control is amazing to say the least, the radial tire is greatly reinforced from the inside which means you can support heavier loads like a medium or large sized RV. The tires also enhance the stability of your RV and make sure that the driving experience is comfortable and quiet. The only downside to this tire is that the traction isn’t the best when used on ice. These heavy duty trailer tires will be able to provide support for even the largest of RVs with thanks to the reinforced structure. This tire is so reinforced it can hold a weight of up to 2,150 lbs. The stability that the tire offers is something that RV owners have dreamt of for a while now, offering a balanced experience as well as exceptional traction control on dry and wet roads. The only reason why these tires are so strong is because of the steel belt that is placed within the tire that stops it from buckling under the weight. These tires are exceptionally great for wet or dry climates, no matter the environment this tire should be able to handle it. The only problem with traction you might have is when driving on ice, this can be expected with almost every tire and you should always be aware of the risks when driving on ice, no matter what tires you have. These tires also have a great balance control on them which gives you extra stability even while holding such incredible weights. Overall, these tires are some of the best trailer tires money can buy and you should seriously consider investing in some. These tires are the best of the Goodyear range, they should be considered as some of the most reliable tires currently on the market from such a great brand. These tires are made to haul heavy loads for long journeys. They come with unique features that help with the effectiveness of the tire. The shallow tread patterns will improve the overall stability of the tire along with the solid shoulder ribs that helps with traction and control on wet or dry roads. 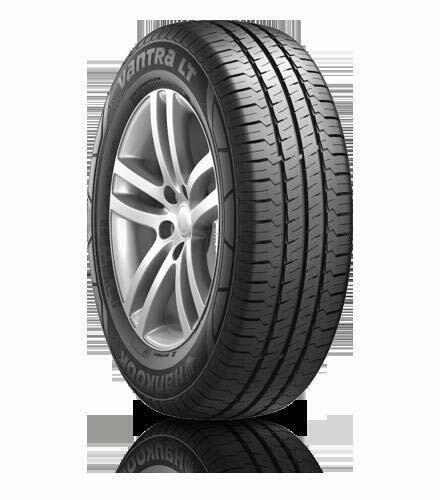 These tires are extremely reliable any various situations and climates, they come from a trustworthy brand that have been trading tires for a long time. The reinforced structure will allow these tires to hold an incredible amount of weight which means that almost any RV should be able to use these tires. The unique design of the ribbed shoulder and shallow tread allow for great traction in both wet and dry environments. However, they’re not suitable on ice. Another downside would be that these tires are incredibly expensive, but, you get what you pay for; an incredible tire. Currently one of the best rated tires on the market and without a doubt the best 19.5 inch tire currently on sale. The tread will allow you to quietly and comfortably drive from point A to point B without a hitch as well as offer enough space for water to flow between which increases traction. The stability of this tire really is something to brag about. Radial tires are best known for long distance journeys but these tires also work just as well for small weekend trips in the summer. The five-rib design allows for great traction in any climate but seem to perform best on wet roads. Working well at both slow and fast speeds, something that these tires weren’t always known for. These tires are the best 19.5 inch tires you’ll find anywhere, they offer a unique ribbed design which is great for traction in dry and wet climates. 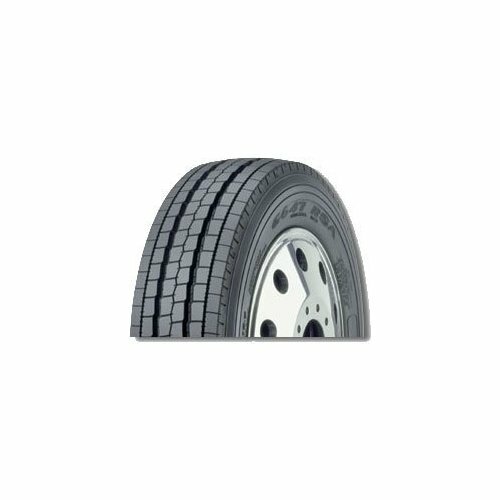 The radial tire has a great reinforced steel structure that allows you to support a vast amount of weight like your RV and everything inside. These tires are great for both long and short journeys which isn’t always the case with radial tires, they’re best known for longer journeys. Again, radial tires aren’t known to travel at speeds over 65MPH. However, these tires can survive these speeds and more which is a huge bonus for anyone thinking about buying these. The only downside to these tires are that heat sometimes penetrates them and can damage the inside rubber, this isn’t usually the case but for some reason these tires don’t have adequate heat protection. This set of two premium quality radial tires are some of the best on the market for fifth wheel RVs. They have a width of 6.5 inches which make this tires thinner than most other radial tires. However, the maximum load is far greater than other radial tires as it can hold 3,640 lbs of weight which is an outstanding amount of pressure on these tires. The PSI of each tire is 80 PSI making them fairly strong with a speed rating of 75 MPH, meaning that these tires can travel 15 MPH faster than what the standard radial tire can. 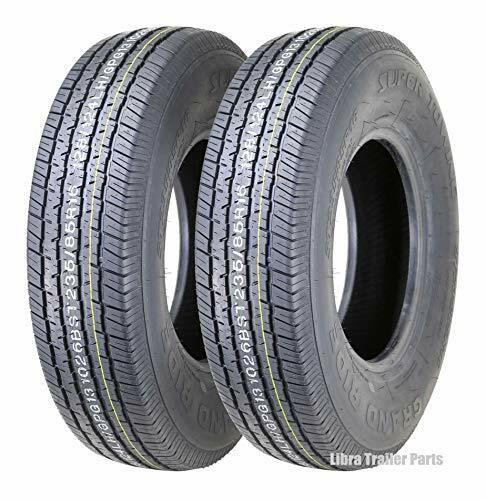 These tires have a nylon overlay across the tread area which acts as a significant upgrade and important safety feature which stops them from blowing out. If you ever find a fault with the tires within the first year you can have them replaced thanks to the warranty. These tires seem to be the best tires for a fifth wheel RV. They allow you to travel 15 MPH faster than what the average radial tire can take you, this might seem like nothing but is a huge upgrade. These tires are also some of the strongest on this list by lifting a phenomenal weight of over 3,640 lbs. The nylon overlay is a significant upgrade and safety feature of this tire which will limit the strain and chance of it bursting. If you do have any problems the one year warranty should cover it. The only real downside to this product is that they can’t handle snow or ice very well and you should take caution during these poor conditions. One of the strongest tires on this list, being able to withstand 4500 lbs of weight from your RV. 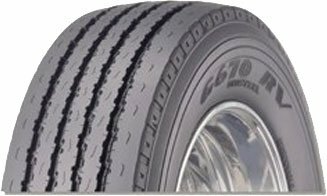 This reinforced commercial truck tire will offer great traction control on any surface during the wet or dry days, it really doesn’t matter. The deep-ribbed grouves act is great irrigation for during those wet days that will allow the water to pass through easily without any disruption. This tire is best suited for those long journeys that take a toll on your standard tires. These tires also have antioxidant compounds that will save your tires from cracking during dry weather. 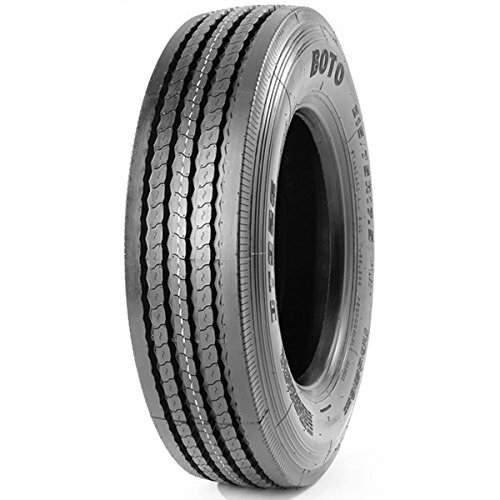 This tire is specially designed to provide the best experience possible for the RV owner. The antioxidant compounds that are included in the tire material helps combat dry days and cracking. The deep ribbed grooves also battle again wet weather as they provide an option for the water to go through, these grooves give your tires outstanding traction control. The reinforced structure also helps the tire withstand the 4,500 lbs of RV placed on top of them. One of the strongest tires on this list The only downsides to these tires are that they aren’t well suited to snow and ice. They’re also incredibly expensive. However, they’ll surely last a long time so they’d be worth the investment. This tire is the best currently on the market for Class C RVs. The Goodyear brand has built of a strong reputation as being the brand of choice when picking your next tire. You’ll receive great traction on all surfaces and benefit from fuel efficiency because of the smart design of these tires. You’ll be driving around quiet and as comfortably as possible. The lower resisting tread is what offers you this fuel efficiency. These tires can also withstand a significant amount of force and travel both long and short distances without any uncomfortable experiences. These tires provide great traction for those dry and wet days when conditions aren’t the best. This is due to the ribbed design of the tire. The smart design and low resistance tread mean that you’ll also benefit from a fuel efficient tire which ultimately saves you money. The tread also offers you the the quiet and comfortable experience while on the road, a great benefit for any RV owner. The only downside to these tires are that you’ll need to take care while driving through ice and snow, this is a common problem with these type of tires. Another downside is that there is a limited range of sizes when it comes to these tires so finding something that fits your RV might be a challenge. This tire is by far the best of the Hankook range. It’s a high-quality tire that any RV owner would like as their backup. The tire is great waterproofing abilities as well as heat resistance during those hot summer days. The enhanced rim joint also adds to why this RV tire is so much better than most at traction control. The same goes for traction control, these tires can withstand any dry or wet climate, the specially designed grips and treads on this tire are far different from their competitors. Heat generation is a primary cause of why your tire needs to be replaced so often, the belt structure helps reduce the heat generation. The main attraction of this tire is that it’s heat resistant properties are far more superior than other tires on the market. This is a huge problem for manufacturers and RV owners is to have a tire that can successfully and continuously fight back against heat and friction. The smart design and the enhanced rim joint are the main reasons why you will have outstanding traction control and a somewhat seamless experience when travelling across the country. They can operate with 100% effectiveness in almost any climate. However, a recurring theme for RV tires is the lack of effectiveness in snowy or icy areas. Another problem that shouldn’t really be a problem is the poor waterproofing, it’s there but just not that great after a long time in wet climates. The tires will begin to degrade after a while if constantly exposed to wet environments. There are a few questions that you need to ask yourself and various considerations to be made before buying your new RV tires. The following section will discuss the different aspects that you need to take into account before buying. This is important to ask yourself when looking for new tires as there are different tires for different kinds of RV. For example special trailer tires are designed specifically for trailer position axles only. Another example could be regarding the length of your journey; Bias-ply tires are best suited for shorter journeys and radial tires are more suited to longer adventures. The weight of your RV can also be a deciding factor on what tire you go for. If you’re driving a large RV with plenty of appliances and people, you’ll need something that can survive the weight for long periods of time. You don’t want blown out tires if your overweight aunt climbs aboard, she’d be heartbroken. So, it’s important that you find the suitable tire to support the weight of your RV. Another consideration should be the environment and climate you’re planning on travelling through. What type of roads and weather will you be travelling in? There are special tires that should be used for more hazardous environments and you need to figure out what exactly you’re putting yourself, your family and your RV through before plowing ahead. The overall lesson here is that there are plenty of tires for multiple different situations which should be considered when travelling throughout the US. Different RVs will require different tires and you need to know your RV inside out before you should be making upgrades. We hope that this article has helped increase your knowledge of the matter. This section will help all those who might be left with additional questions on the topic. We’ve compiled a list of common questions and answered them the best we can. We hope this helps you out. Different tires will last various amounts of time, it really depends on what kind of travelling you’re doing. However, the common rule of thumb is to change them every 3-6 years. It’s not common for an RV tire to last this long but it does happen. Should You Balance Travel Trailer Tires? They do not need to be balanced. The reason for this is because a trailer tires main role is to simply support the vertical load and not for steering and cornering. How Many Wheels Does An RV Have? This might seem like a really simple question but you can get RV’s that come with varying amounts of tires depending on the size and load. You can have RV’s with three tires that connect to the back of your car (more like caravans) or you can have your standard four wheeled RVs; Larger RVs could have up to six wheels in total because of their weight and size. You should cover your tires as this protects them from the harsh damage that the heat from the sun causes, as they can penetrate inside the tire. You should also cover them from the wet environments as sometimes they can degrade faster if they’re constantly wet.